BACKGROUND: As many are aware, dishonest (not “mistaken”) intelligence greased the skids for the widespread killing and maiming in the Middle East that began with the Cheney/Bush “Shock and Awe” attack on Iraq. The media reveled in the unconscionable (but $$$ lucrative) buzzword “shock-and-awe” for the initial attack. In retrospect, the real shock lies in the awe-some complicity of virtually all “mainstream media” in the leading false predicate for this war of aggression weapons of mass destruction (WMD). Only onee major media group, Knight Ridder, avoided the presstitution, so to speak. It faced into the headwinds blowing from the “acceptable” narrative, did the investigative spadework, and found patriotic insiders who told them the truth. 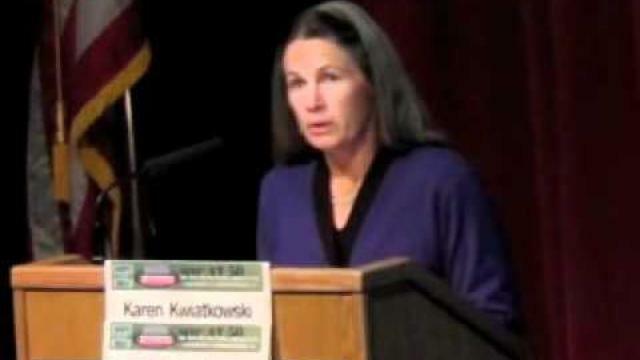 Karen Kwiatkowski, who had a front-row seat at the Pentagon, was one key source for the intrepid Knight Ridder journalists. Karen tells us that her actual role is accurately portrayed in the professional actress in the movie. For the record, none were found because there were none, although Clapper -- "eager to help" -- gave it the old college try. As for the self-licking ice cream cone that “mainstream media” have become, and how they overlook little peccadillos like feeding at the government PR trough and helping Cheney and Bush attack Iraq, well now, now ⢀ let’s not be nasty. Here’s how Jill Abramson, NY Times Washington Bureau Chief from 2000 to 2003 while the Times acted as drum major for the war, lets Bob Woodward off the hook for his own abysmal investigative performance. Are we to believe the Abramsons, Woodwards, et al. of the media elite simply missed the WMD deception. (Hundreds of insiders knew of it, and some were willing to share the truth with Knight Ridder reporters.) Or did the media moguls simply hunker down and let themselves be co-opted into helping Cheney/Bush start a major war? The latter seems much more likely: and transparent attempts to cover up for one another, still, is particularly sad and consequential. Having suffeered no consequences (for example, in 2003 Abramson was promoted to Managing Editor of the NYT), the “mainstream media” appear just as likely to do a redux on Iran.